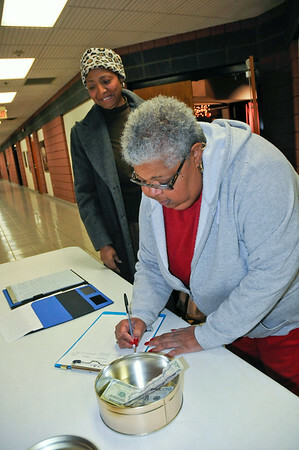 James Neiss/staff photographerNiagara Falls, NY - Mae Nix, who described herself as a concerned citizen, signs a petition in support of reopening the Niagara Community Center after donating money to help the cause. Members of the Niagara Community Center Concerned Citizens Coalition held a rally at the Doris Jones Resource Building for their purpose. Drucellia Shealey, treasure of the N5C stands behind.